Chop, Twist, Curl, Press, Extension…. I do it all with my medicine ball. I typically mix it in with leg exercises to make it harder, more interesting, raise the intensity, and raise my hear trate. 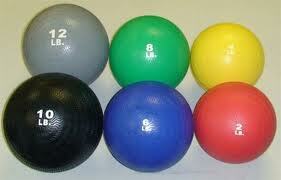 Since my medicine ball isn’t heavy (6 – 10 lbs), I typically do these for reps (20) or time (1 – 2 minutes). For me, compound and functional exercises have produced defined muscles (without traditional “lifting”), a stronger core (without countless crunches), my endurance has improved, and I definitely fit into my clothes differently. 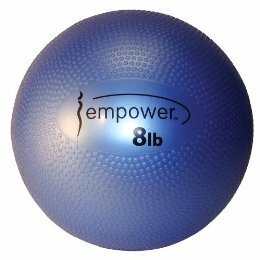 So I am a convert – I love my medicine ball. Did I mention I love my medicine ball? What have I left out? As you know, Sonjia has introduced me to new exercises & workouts that challenge me in various ways. She was recently certified in CrossFit, which is a really fun approach and is built on balancing 10 areas of overall fitness. Some of the workouts are a bit more intense than I am ready for, so I am fond of being able to modify. I modified the pull ups, others may want to modify the pushups. But this is a great one to benchmark your own abilities. Repeat for 20 minutes and count how many sets you do. One of the great things about this is we can repeat periodically to see how we improve. I feel like I’m getting stronger, but actually tracking this on a piece of paper proves it. Can I hear a Woo Hoo?!?!?! After working with my trainer for a while, I’m still amazed that she can create interesting, challenging, and fun workouts. I haven’t been sore in a while – I’m getting stronger in so many ways – but I must admit, this one got me. I was slow – it took me 50 minutes – but I completed every repetition for every set for every exercise – so in my book – that’s great! There are several cool things about these moves – they work multiple muscle groups that get your whole body, they engage the core (sans crunches), and they get your heartrate up. Another great thing about this workout is that it’s scalable – each move can be made easier or harder based on one’s strength and fitness. Give it a try – let me know what you think! For those that know me, you know that Sonjia (prounounced Sone-Yah – not Sone-Jye-Ah) has been a big part of incorporating exercise into a healthy lifestyle. I’ve had trainers before – blah blah blah. I’ve even gone through periods of fairly regular exercise. But Sonjia is different. She has opened my world to big, functional, compound exercises that combine strength and cardio into challenging but doable workouts. These efficient circuits have produced results – my clothes fit differently, my endurance is better, and I am definitely stronger. So here she is – in her video DEBUT – showing off one of our favorite exercises – the Wall Ball. Sometimes we do it for reps (about 20 per set), tabata (20 seconds hard, 10 seconds rest, repeat for 4 minutes), or time (1 or 2 minutes) as part of a larger circuit training. In her words, “You’re going to LOVE this!” Note: That’s code for this is harder than it looks (which is good, because I need to be tricked into working hard). Do you have any favorite “harder than they look” exercises?